D020D from Sunshine, FC-1000 from Steven and a took a chance on a 2 layer arm perc bubbler from an unknown. My daily driver for the past 2.5 years has been the Sublimator with a DG fritted disk bubbler, so I was excited to try a new piece. Considering the price difference this is a wonderful piece of glass. Stellar service from sunshine store too. No defect that I could find, carefully packaged and shipped very quickly. A bit smaller than I thought, I think the FC-1000 will be the perfect fit. I can see myself using the D020D with my Mighty around the house or outside during Summer. which one is which? And which one do you like best? The one on the left (orange and blue disk) is the legit David Goldstein piece. The one on the right is the D020-D.
Afaik nothing beats the DG piece if what you want is smoothness over anything else with a single chamber. You do lose flavor, and it clogs rather quickly with an effective vape like the sublimator or cloud evo. That said you could buy ten D020D for the price of a single rooster piece. Is it worth it? If money is not an issue and you want the ultimate smoothest setup I think it is worth it, otherwise not so much. I look forward to try the FC-1000 and see how pillars compare. 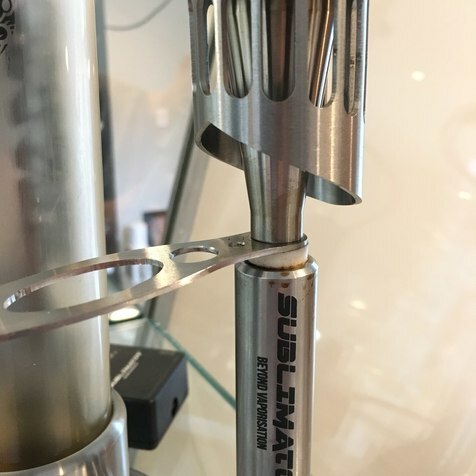 I now own 8 vapes thanks to this website and another forum and the Sublimator is, by far, my favorite. 1. Full metal/glass path everywhere makes cleaning a breeze. For daily users who dirty up their vapes and glass every day, it's a gigantic time saver. 3. Unloading and reloading a bowl takes SECONDS. Quickest of any vape I own or ever tried. 4. Best quality vapor of all my vapes. Setting 8 or 9 for flower is my sweetspot. 5. Though the 1 hour timer is annoying, I reset it once in a while by double tapping the controller knob so the vape stays on all day long, just like a log vape. 6. It's a consistent device. After 2.5 years it functions like new. Mostly because it's so easy to clean and maintain. Otherwise I don't see myself living without it. I can milk .3 through my fritted disc bubbler with it and not even feel the tingling of a cough. It's kind of hard to believe until you experience it. Sunshinestore also makes a fritted disc knock off and I ordered one to compare the performance to my legit piece. Can't wait to see the difference. There probably won't be any. Amazing and I agree with your points! Really? Wasn't this the "kind of want my money back" vape??? Bud, definitely agree with you about the poor QC. I think that is probably what prompted your "I want my money back" comment. Feels awful to pay this much for problems. I actually went through this with my Cloud EVO when I first got it. My units had no QC issues, and I did not get their glass -- I already had my rooster piece, so only got the Apollo, so it seemed like a smaller purchase. The mix of conduction and convection, paired with all metal/glass path, makes it King of Hill. 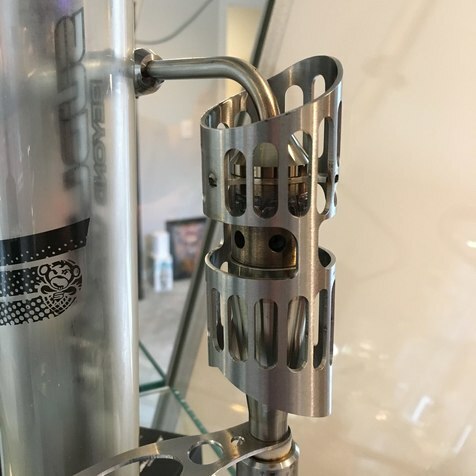 I noticed a couple copy cats have come out, notably the flower pot from newvape. Which, at 550$, is about the same price as the sublimator. YMMV, but any experienced vaporist should at least try it. Thanks. Didn't mean to poo-poo on our vape. I have never even seen one much less use one. I'm glad that Bud now seems to enjoy his Sublimator. Don't mind (or care) if you poo poo on any vape I own ;) All the power to users and opinions, it makes it easier for people to be informed. One thing that makes me uncomfortable on FC is how the staff is so much in bed with manufacturers sometimes. I've often seen opinions being suppressed in the name of keeping the peace. Unacceptable. Christmas keeps arriving in this household. Mailman brought another gift today. First reaction when I opened the package: this is a big piece. See comparison photos with my rooster piece and the D020-D below. Had a small dent on the top, won't affect function. Pillars are straight. Nice wielding. Carefully packaged (double boxed) and shipped in a timely manner. A function video: I experimented with water levels and less water works better for me. With the amount of water in this video there was too much drag for my taste. A bit above the bottom perc seems to work best for me. DG rooster piece on left, FC-1000 on right. D020-D on left, FC-1000 on right. I wonder what their baby would look like. I got one final piece (fritted disk) coming from sunshine. Then I think my GAS will be satiated for some time. None of my new pieces will replace my daily driver, but thanks to China, not an expensive lesson, and I will still get use out of them.